Grasslands Closeup, National Bison Range, Montana. Most of the center of North America was covered by grasslands or prairies before the arrival of European settlers. 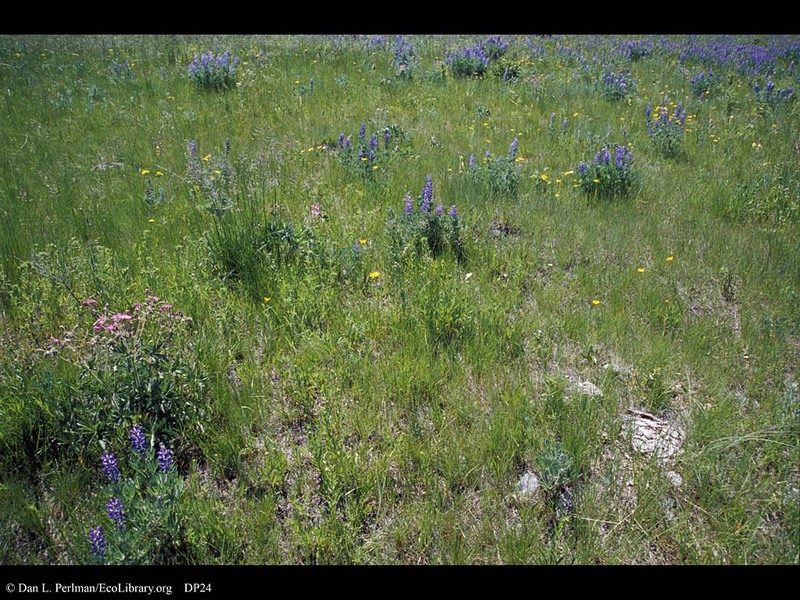 These lands were quite diverse, as they supported many different species of grasses as well as a large number of wildflowers. This image also shows nutrient cycling in action, with the pat of bison dung in the foreground. Relatively low rainfall throughout the region, combined with the heavy use of fire in the eastern portions of the grasslands by Native Americans, kept the area in grassland rather than forest. This particular grassland exists as part of the National Bison Range. Established in 1908 by President Theodore Roosevelt, the Range was one of the first Federal wildlife refuges in the US and it played a critical role in saving the bison. Although their populations probably numbered in the tens of millions in the early 19th century, some researchers estimate that there were fewer than 1,000 bison alive in 1890, putting the species very near extinction. Through the efforts of early and staunch conservationists William T. Hornaday and President Roosevelt, these magnificent animals were brought back from the brink and they are well protected today.